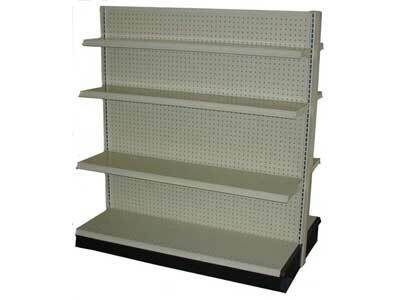 Gondola Shelving as pictured above is believed to be originated in the 50's by 2 companies that have evolved one way or another into Madix, Inc. and Lozier. Some of the components between the two are interchangeable. If you were to look at the both manufactures sitting side by side you would not notice much difference. The two main configurations are the Island Gondola and what is known as the Half Gondola. The Island Gondola is more of a freestanding type of display generally used as its name applies an Island in the more center portion of the store. 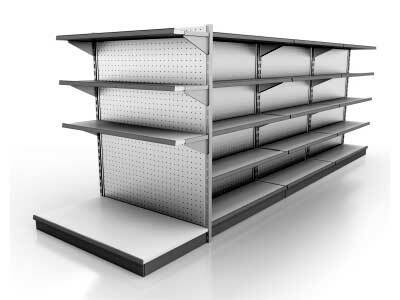 The shelving sections are constructed to be connected together end to end to create an aisle or row of shelving as long as needed. The Half Gondola is as it's name applies and only provides the ability to display or merchandise items or product on one side of the fixture. The half Gondola is generally placed up against a wall to provide support on the back end. The components used to assemble Gondola Shelving are all the same making the Island and Half Gondolas interchangeable. The main structural components are known as the Basic Upright, the Base Shoe, Base Shelf, the Back Board and the three spanners that basically hold everything together, the spanners connect the uprights together, and hold the back boards in place. The trim pieces are known as the Upright Cover, the Base Shoe cover, and the Front Kickplate. All of these components are available in either a kit or sold by them selves, incase replacement parts are needed. The back boards of the section or unit provide all of the stability of the Gondola. If the backboards are not cut to the perfect specification the Gondola Unit will be wobbly and can cause failure of the Gondola Unit. If your have the need for Gondola Shelving in order to receive an accurate quote for Gondolas we need to know how long you need your row or aisle to be, how high, how deep the base shelf needs to be and how deep you need your upper shelves to be as the upper shelves are sold separately. 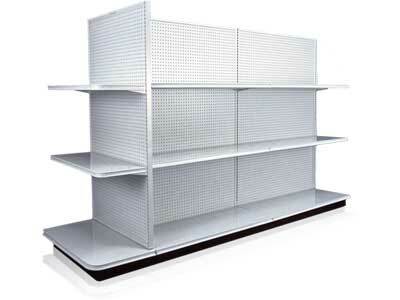 Fences and dividers are also a very popular accessory for store shelving as they can divide a shelf onto sections for different size products and to contain the product or merchandise on a shelf so it does not fall off the shelf. Some of the most notable accessories are what is know as an End Cap that is generally placed at the end of a row of Island Gondolas. 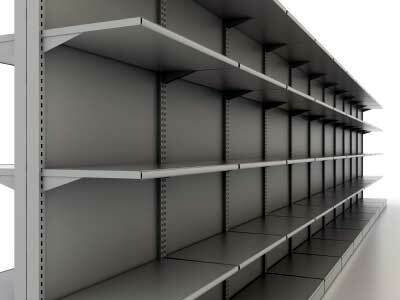 The end cap adds an attractive shelving section to the end of an aisle or row of Gondolas. The most popular end cap is with the use of a Half Gondola simply placed up against the end of a Island Gondola. The second most popular is what is known as an end frame that actually attaches or mounts onto the end of an aisle or row of Gondola Shelving. Many other types of ends are available such as a wire grid can be used as an end or anything you can imagine or think up can be placed at the end of an existing Gondola. Gondola Shelving typically ships on a freight truck. The Gondola pieces are placed on a pallet and the pallets are then placed on an eighteen wheel truck for final shipment to the customer that is either opening a new retail store or is adding shelving units to an existing store. The upper and base shelves are packed onto a 4' X 4' pallet some times as high as 8 feet and the uprights and back boards are packed onto a pallet that would meet the size required.